See you at SUMMER NAMM in Nashville!!! Andy Hong and Reid Shippen have purchased a 24 input FIX console for Nashville!!! FIX Audio Designs will be delivering a 64 input IMMERSIVE console to a client in NY, with 7.1 panning on the floor including mid-surround, and quad panning for the ceiling. Terry Lewis and Jimmy Jam for Flyte Tyme Productions at the California studio facility. The console will be used for tracking and summing/mixing along with the dual Slate Raven system installed. Delivery is expected soon after NAMM. The console will have 4) Tonelux MP5A mic preamps, with 3) rack mounted bus compressors built in, for the 3) stereo mix busses included on the console. Wolff’s first console sold under the FIX logo was sold to Gregor Schweiger in Gemany, and consisted of a 64 input surround console, with over 140) 500 series module slots. An Infinitely adjustable and expandable frame design that can be set at just about any angle. "We need a Blender", so I went over to the cabinet.., He said "No, I mean a blender for parallel blending". Blending a Compressor or Equalizer with the original or “DRY” signal adds a lot to the sound of a track. The combination of the two signals can add fatness to an instrument like a bass or whole drum kit while retaining the punch. ...delivers textures and extraordinary richness to vocals and polyphonic instruments. The Fix Doubler sounds like the singer cloned themselves and is singing along with the original vocal. It uses techniques that are unique and the sound is so musical. Paul Wolff and Softube have truly come up with a brilliant new plugin. Both units are very smooth and creamy. Fix Flanger is the first in-the box-flanger that sounds like real old school flanging with a new school twist. And the Fix Doubler adds a wonderful sonic quality and depth. Ross Hogarth, Multi-Grammy Award winning producer, mixer and engineer for Van Halen, Keb 'Mo' R.E.M. and Ziggy Marley. Like Paul's other stuff, it just works great right out of the box. I used the Fix Flanger on a pedal steel and I used the Doubler on a background vocal and it all worked great. Really smooth and realistic. Bob Dawson, Twice Grammy Award winner and multiple times Grammy nominee. The sound of classic tape flanging, with extreme control and flexibility. Unprecedented hands-on VSO control, with servo motor bounce emulation. The Fix Flanger just sounds right. It's not artificial or cold, it's full and inviting. The Fix Doubler has a magic way of making stuff bigger, especially in the stereo field, in a way nothing else does. Reid Shippen, Seven times Grammy Award winner. Reid has mixed, engineered, and/or produced music for Death Cab for Cutie, Shania Twain and Jonas Brothers. Fix Flanger and Doubler are the most analog sounding flanging plug-ins I've ever tried. 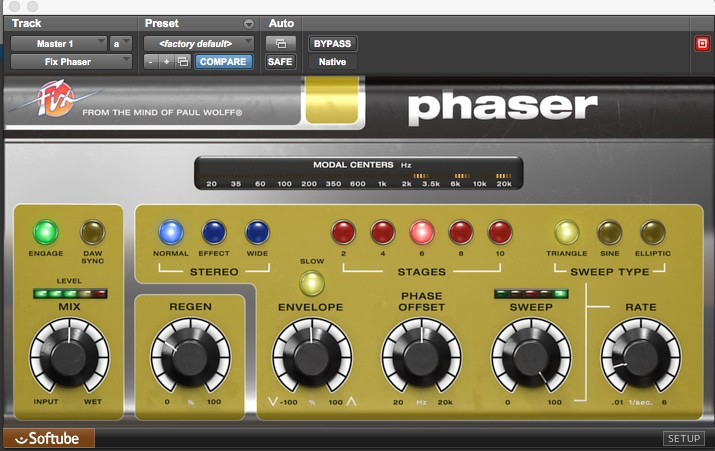 I own several of the classic units, but having the extra control as a digital plug-in has made me an addict. Rafa Sardina, Twelve times Grammy and Latin Grammy winning (49 nominations!) producer/mixer/engineer for Stevie Wonder, Elvis Costello, Lady Gaga, Michael Jackson and countless others. The Fix Flanger captures all the best characters of tape- and digital hardware flanging. The Regenerate feature is dynamic but always controllable and the VSO features makes it truly unique. This makes it the perfect tool for drum flanging effects.